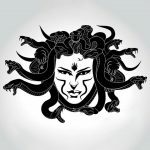 Medusa is a sea serpent monster from Greek Mythology that has survived the test of time and is still a part of popular character in literature and art. Tattooists have long experimented with the image of Medusa to create brilliant pieces of tattoo art and these top ten Medusa tattoos are just a few of the best examples. 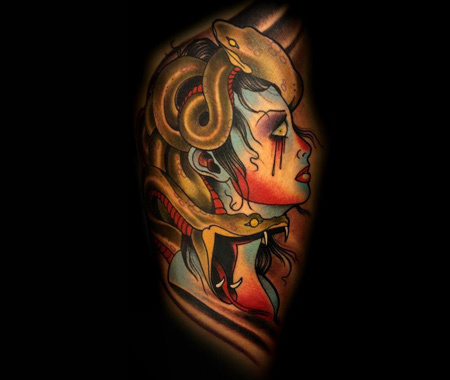 This upper arm Medusa tattoo design has been created using black ink as the primary colour. However what stands out the most are the blood red eyes and Medusa’s scarlet ruby ornaments. 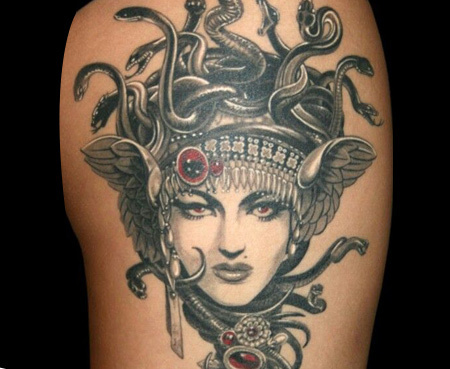 In this tattoo the conventionally frightful Medusa has been infused with a generous dose of glamour. 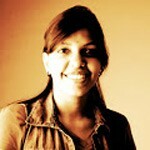 Make a note of the magnetic aura of this piece of brilliant art. 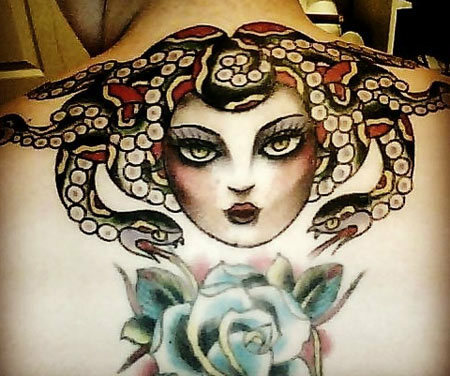 This Medusa tattoo effectively covers a small portion on the center of the upper back just below the neck. Good tattoo art looks even better when inscribed on strategic parts of the body and this tattoo only serves to support this fact. 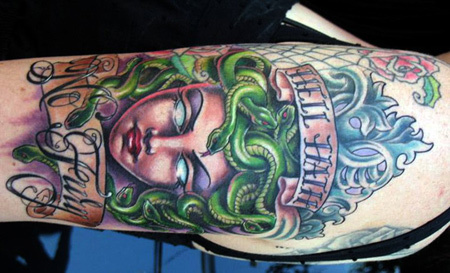 This macabre Medusa tattoo is accompanied by a part of the age old adage “Hell hath no fury as a woman scorned”. In this age of women’s empowerment this brilliant tattoo has an aggressive but resounding message for everyone. This is the perfect find for the independent women who could be aggressive if the situation demands it. This Medusa back tattoo stands out for the varied use shades of red, black and blue to express a macabre theme. Make a note of the aggressive and frightful snakes baring their fangs which perfectly contrasts with the calm, almost sleepy expression on Medusa’s face. Have this replicated on your skin as it is depicted here by a seasoned tattoo expert to avoid any mess ups. Blue, red, gold and black, this tattoo boasts of a varied palette of colors in just the right proportions. Make a note of the vacant stare in Medusa’s eyes accompanied by an exaggerated and dramatic depiction of tears. Look closely at the frightful snakes with their beady eyes and fangs bared with an apparent intent to hurt. This is indeed one dramatic piece of art. Medusa was a serpent monster according to Greek mythology and this Medusa inspired tattoo depicts a ship caught in a stormy sea making its way towards the shore guided by a lighthouse. There is a sense of impending doom perhaps owing to the presence of Medusa lurking under the surface of the waters, ready to strike at any time. 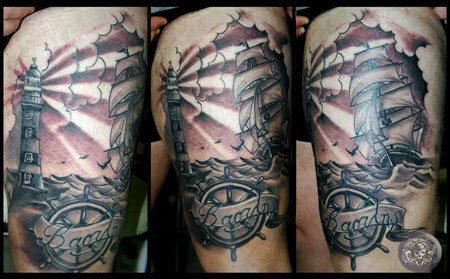 This tattoo is a great example of tattoo art that often aim to tell a story. 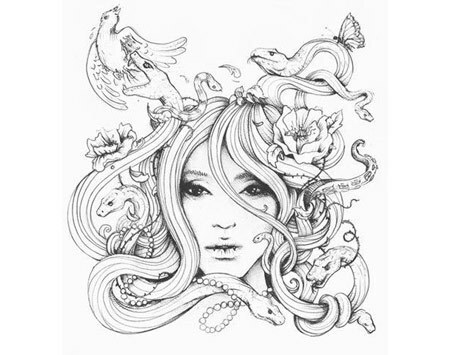 This is just a conceptualization of a great Medusa tattoo on paper. Make a note of the calm and even delicate demeanor of Medusa that perfectly contrasts with the serpents that seem to be on a mission to destroy and consume everything that gets in their way. This tattoo is the perfect combination of calm and aggression, perhaps frighteningly so. 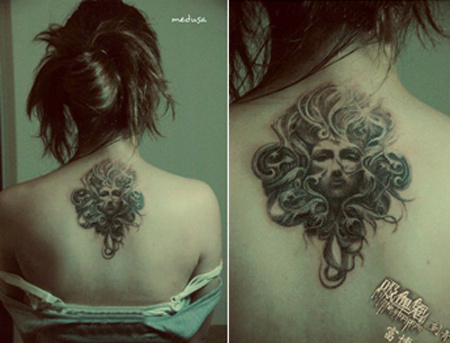 This tattoo aims to depict Medusa in a contemporary avatar and manages to do so quite convincingly. Make a note of how the serpent hair has been toned down to just one small yet effective serpent and a very trendy and contemporary hairstyle. Take a close look at the glossy lip, eyebrows and eye makeup all of which contrast with the macabre vacant eyes. 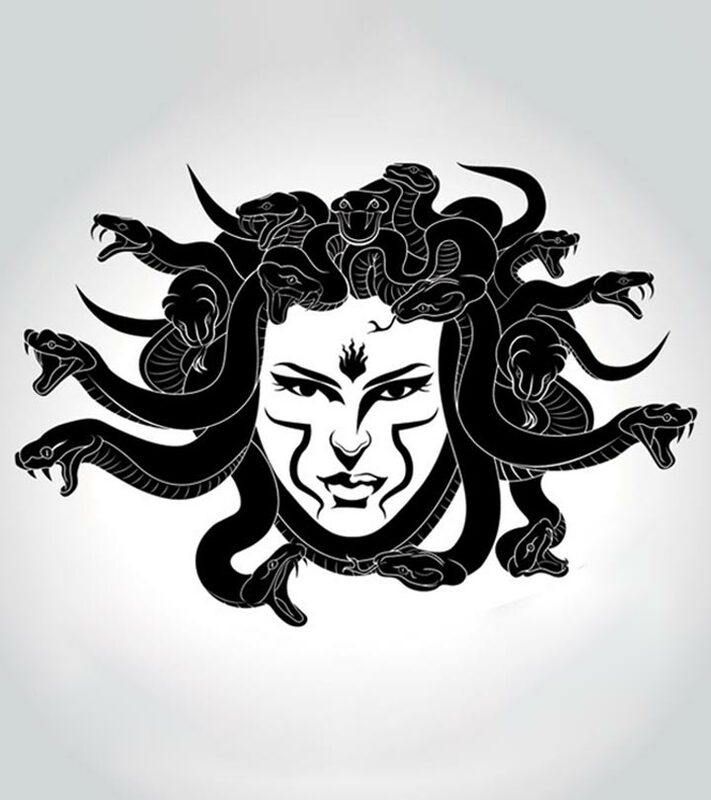 Conventionally most Medusa tattoo designs are inscribed on the upper arms, forearms or back however this Medusa tattoo effectively covers the wrists and the hands just above the fingers. Make a note of the fine details and shading work used to depict fine lines under the eyes and wrinkles on the skin which is reminiscent of a decaying corpse. 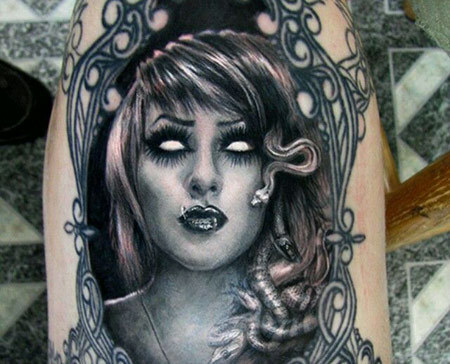 This Medusa tattoo is frighteningly realistic. 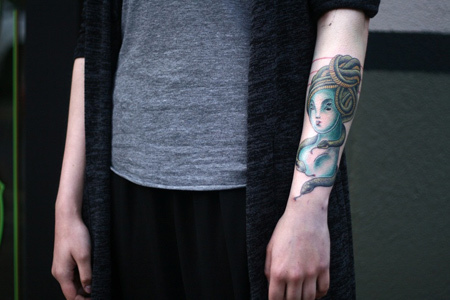 This Medusa tattoo has an apparent subtle and quaint depiction of Medusa that is effectively mysterious, a quality well suited to a legendary monster from the sea. Have this replicated on your skin keeping in mind the original piece of tattoo art as depicted here.